Energy source 4:1 Summer Fruits is an all-in-one sports drink which helps sustain performance during endurance exercise and enhances absorption of water to prevent dehydration. 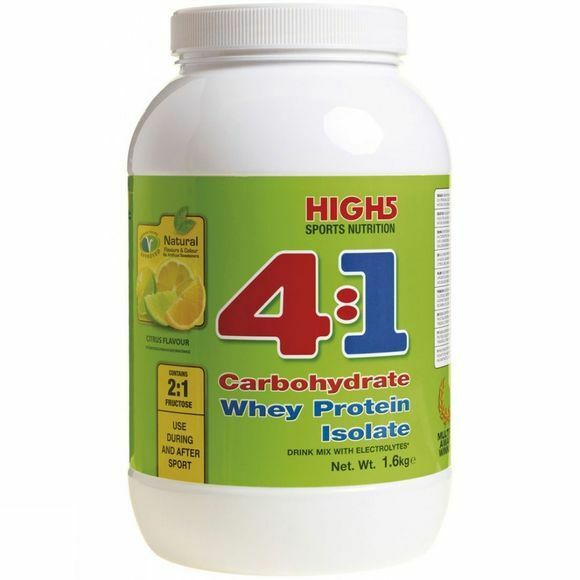 As part of the High5 4:1 range, it contains 4 parts carbohydrate to 1 part protein and key electrolytes. Keep sipping post-exercise, as this formula promotes recovery of normal muscle function after exercise and growth & maintenance of muscle mass. This product is recommended for periods of tough training, multi-day endurance events or a big step-up in training intensity or volume. Maltodextrin, sucrose (22%), whey protein isolate (20%), fructose (18%), Food acids (malic acid, citric acid), acidity regulators (tri sodium citrate, potassium citrate), natural flavouring (lemon, lime, orange), sea salt (0.3%), emulsifier (soy lecithin).